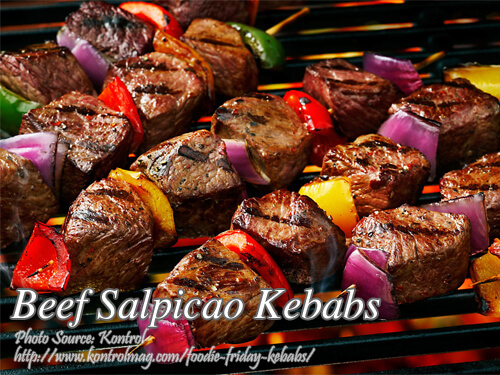 If you are looking for a beef salpicao with a twist, why not try this beef salpicao kebabs? It is made from beef tenderloin and veggies like carrots, beets and zucchini. If you want you can also use other kinds of veggies or even fruits like pineapples or apples. It is so simple to prepare and all you have to do is slice the ingredients, marinate and put them on skewers. You can either grill them or roast them in the oven. To cook salpicao kebabs; Make a marinade by combining olive oil, garlic, paprika, rosemary, salt, pepper and cayenne in a bowl and mix well. Set aside. Place beef cubes and vegetables in a bowl. Pour marinade over beef and veggies. Put in a zip lock container or zip bag and seal. Refrigerate for 30 minutes and gently mix occasionally. Thread meat and veggies alternately on skewers. Grill the kebabs on hot charcoal or flame. Then baste with the remaining marinade halfway through cooking. If you are looking for a beef salpicao with a twist, why not try this beef salpicao kebabs? It is made from beef tenderloin and veggies like carrots, beets and zucchini. Make a marinade by combining olive oil, garlic, paprika, rosemary, salt, pepper and cayenne in a bowl and mix well. Set aside. Place beef cubes and vegetables in a bowl. Pour marinade over beef and veggies. Put in a zip lock container or zip bag and seal. Refrigerate for 30 minutes and gently mix occasionally. Thread meat and veggies alternately on skewers. Grill the kebabs on hot charcoal or flame. Then baste with the remaining marinade halfway through cooking. Serve hot.